Delaware Hayes head football coach Mike Golden believes his team needs to execute perfectly to be successful on offense. The Pacers did not do that Friday night at Cornell Stadium. And Dublin Scioto made enough plays to squeak out a 10-0 win in Delaware’s OCC-Cardinal opener. The Pacers were held to just 65 yards of total offense, including 47 on the ground in defeat. Senior Jaden Penn broke loose on a short pass and went 83 yards for a touchdown to put the game out of reach for the Irish (2-3, 1-1). Oddly, both of Scioto’s scoring drives came after a 44-yard punt by Delaware’s Mason Davis pinned the Irish deep. Griffin Crosa’s 32-yard field goal as time expired on the first half clock broke the scoring seal. Scioto drove 80 yards in the final 55 seconds to set up the field goal. The Pacers (2-3, 0-1) called a timeout after the first play of the go-ahead drive, but it came back to haunt them. Scioto QB Kyron Rogers competed a 21-yard pass to Jaden Penn and passes of 15- and 20-yards to Jacob Jones as the Irish got in field goal range. Scioto’s field goal unit kept the Pacers in the game. Crosa missed on his first attempt – a 36-yard attempt in the first quarter. He lined up for another 36-yard attempt in the second quarter, but the ball was snapped over holder Logan Williams’ head and Crosa fell on it at midfield for a 31-yard loss. But, the Pacers – held to just one first down in the opening half — struggled moving the ball. 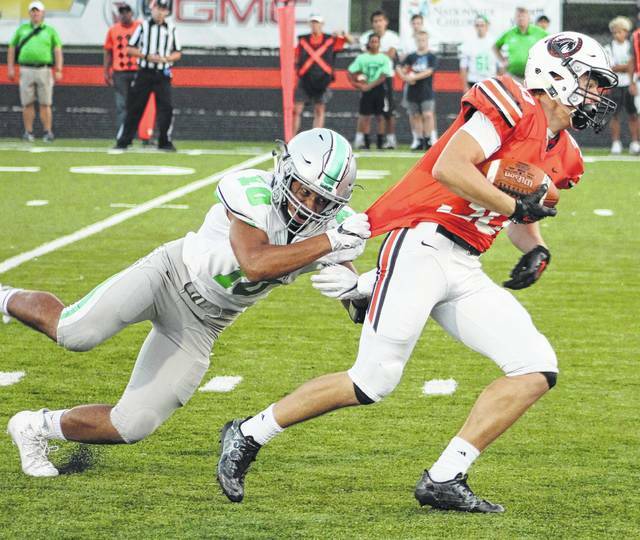 Delaware continues league play with a visit to Worthington Kilbourne Friday night at 7 p.m.
Dublin Scioto’s Gabe Wallace (10) drags down Hayes’ Sam Lagando during the first half of Friday’s OCC showdown in Delaware.